What is the difference between a “Holiday Parade” and a “Christmas Parade?” Not much, actually. But the fact that La Jolla continues to call their December parade a “Christmas Parade” bothers some residents of this snobby, exclusive city. Many years ago – 1965 – to be exact, my husband and I decided to take a trip to La Jolla. We knew we would be moving to the San Diego area shortly, because my father-in-law was quite ill and lived in Chula Vista. We decided to make a vacation of it, and driving down from Berkeley where we were going to school we stopped off at a hotel in La Jolla. I was wearing a beautiful Star of David given to me on my 18th birthday by my ex-husband. My current husband – Bob – was not Jewish, but the star was so pretty that I wore it frequently. As was usually the case, I got out of the car and went to the registration desk. The clerk looked at me and said, “I’m sorry. We do not cater to your kind.” What in the hell was he talking about? He didn’t cater to “my kind?” What kind was I? I said, “I beg your pardon. I don’t understand.” He said, under his breath, “you Jews just don’t want to understand.” And that was my first introduction to anti-Semitism – in a nice hotel in the middle of La Jolla. As ironic as things can be, there was a period of time that I even worked in La Jolla, and to make it even funnier, I worked for the Copley Press in their Art studio on Herschel Street. (Funny because growing up in the Borsch Belt in Los Angeles, “Herschel” was a definite Hebrew name.) Although there was no more out-right snobbery, I was not welcomed into the restaurants I frequented with open arms. I was usually seated in the worst place – next to the bathroom or the kitchen; I was always greeted with a “hello”; but not with a friendly smile. It only took me a few weeks to discover what was wrong but I thrive on controversy so I continued wearing my star and patronized those establishments that wished I wasn’t a customer. After I went back into the field of education, I became the chorus director for the several schools that I taught in. We began practicing singing Christmas carols in early October, and sang them daily until our Christmas pageant. Sometimes I would throw in a Hebrew song – “Dreidel”; or an other such song. Until one day a parent protested that she was not Christian; she was not Jewish; and, in fact, celebrated Kwanzaa and her children were asking why we were singing Christmas carols. It was causing a problem at home and although she did not want to have her child drop out of chorus, the conflicts were not worth the effort of keeping the child in a class that was in direct opposition with the families beliefs. After discussion with the PTA; the principal and other staff members, we decided that we wanted to reach ALL people in the community and would change the name of our annual “Christmas” show to our “Holiday Show.” It was no big deal; we still sang Christmas carols, but now we incorporated many non-denominational songs for everyone. Santa still came to hand out gifts; the menorah was displayed when Jewish songs were sung, and everyone looked upon the changes as a positive experience as well as a learning experience. As time passed, it was apparent that the parent who came to see me was not unlike many other people in communities throughout the United States. Many, many “Christmas Parades” were changed to “Holiday Parades” and no one thought anything about it. Everyone was included; no one felt excluded because they did not hold the Christian beliefs. And since there were so many other religions that had their holidays during the month of December it was a fairer way of including the entire community. And, interestingly enough, more volunteering happened; more donations were given; and the name change has been a positive factor every year. From its beginnings through the early 1960s, La Jolla was marketed by developers as a bastion of isolation and exclusivity. Antisemitic housing practices began in 1926 with the development of La Jolla Shores. In La Jolla Shores and La Jolla Hermosa, only people with “pure” European ancestry could own property (this excluded Jews, who were not considered white), and housing advertisements included prohibitions against Jews and other minority groups. Such “restrictive covenants” were once fairly common throughout the United States, although the 1948 Supreme Court case Shelley v. Kraemer ruled them to be unenforceable, and Congress outlawed them twenty years later. After the Supreme Court ruling, real estate companies used less obvious tactics to keep Jewish people out of La Jolla. Real estate agents would be fired if they sold a house to Jewish clients. There were no for-sale signs put up on properties, requiring the prospective buyer to go to a real estate office to find out what was available. If an agent suspected that a potential home buyer was a Jew, they would demand higher down payments and display green cards on their dashboards marked with the Star of David to warn the seller. The sellers would also send codes to their real estate agents; if their porch lights were on during the day, they did not want Jewish buyers. 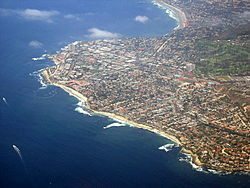 In 2003 a writer for the San Diego Jewish Journal reported, “When world-renowned British mathematician/philosopher Jacob Bronowski was brought to the Salk Institute by Jonas Salk in 1963, he wanted to buy a piece of land on La Jolla Farms Road for the purpose of building a house for his family. But the land was part of William Black’s Beach and Bridle Club, and the Bronowskis were required to produce three written character references.” The family produced letters from members of Parliament. By 1962, La Jolla, and the non-restrictive La Jolla Scenic Heights in particular, had a substantial Jewish population due to talk of establishing UCSD in the area. The university would bring many Jewish professors, who would need to live in nearby areas such as La Jolla. In the words of UCSD patriarch Roger Revelle, “You can’t have a university without having Jewish professors. The Real Estate Broker’s Association and their supporters in La Jolla had to make up their minds whether they wanted a university or an anti-Semitic covenant. You couldn’t have both.” La Jolla now boasts a large and thriving Jewish population, and there are three large synagogues in La Jolla. I realize that I am writing this article in March. The Holiday season is still 9 months away. It takes time to make changes – publicity, posters, banners, etc. But it is not too soon to start thinking about making a change. In fact, NOW IS the time to make the change. I also want to point out that I am not doing this because I was born to two Jewish parents; I was married to a Catholic for 44 years. We celebrated all holidays – our children celebrated all holidays – their children – my grandchildren – celebrate all holidays. Rather, it is a way of involving the entire community; a way of welcoming everyone to the shores of La Jolla. A way of showing respect for everyone – no matter where they live, how they were raised, and what their beliefs might be. La Jolla is a thriving, wealthy community because they are now a “salad bowl” of residents. It is time that the beautiful parade that highlights La Jolla in December include everyone. That’s what makes San Diego so wonderful. Wouldn’t it be nice if La Jolla could be part of the entire community? Very interesting and abut LJ’s anti non white past. In a way it’s not too surprising because I grew up on the Palos Verdes Peninsula and it has a very similar past. Businesses, real estate offices, country clubs all had very similar policies all the way up to the mid 70’s. Sadly, this was common in many parts of San Diego. Burlingame . for example. Much of North Park, too. In fact, many of the old deeds still have that restrictive language in them, but, if you ask the real estate agent, they will quickly tell you that it is no longer enforceable. I can’t help but think that this history makes the cross on Mt. Soledad something equivalent to a dog”marking” a fire hydrant – a way of claiming territory. But heck, San Diego schools were forced, by a judge, to be integrated twenty years after Brown v Board of Ed. I have sourced Wikipedia and entered Palos Verdes Estates, CA and and Burlingame, CA. This journalist is correct. There is only one city or town in the USA which had and still has virulent anti-Semitism as described by sourcing Wikipedia, entering: La Jolla, California, then 1.3 should be selected. Within the Wikipedia 1.3 paragraphs, Wikipedia Reference (footnotes) 23., 24. and 25. should be read. Although 25. is quite lengthy, Mary Ellen Stratthaus, the journalist and researcher, wrote a magnificent article. Pfaff – just to be clear, the Burlingame I was referring to is a neighborhood in San Diego, not the town of Burlingame, CA. Thanks for your clarification re the neighborhood of Burlingame in the City of San Diego. However, I was referring to the Wikipedia description of La Jolla, California. When you finish reading footnote 25., you will see the mean-spirit and prejudice of each and every La Jolla realtor. I guess Albert Einstein wouldn’t have been welcome in LaJolla a few years ago either. Or Sigmund Freud. Or Jesus for that matter who lived and died a Jew. It wasn’t until many years later that they decided to change his religion so that the Christians, which were originally a Jewish sect, could recruit adult males without them having to get circumcized. I guess now the haters have moved on from Jews to Muslims. 1965 was a lloooooong time ago. I am neither Christian nor Jewish (and don’t wish to elaborate). I enjoy attending festivities representative of a wide variety of cultures, ethnicities and spiritual beliefs. I do not believe that interfering with anyone’s holiday celebrations ought to occur. I especially don’t believe in encouraging the numerous individuals navigating life just waiting to be offended. Our splintered species is a result. We ought celebrate our differences not be divided by them. The current state of “political correctness” borders on insanity and subsequent attempts to “homogenize” us at the loss of rich cultural ties is similarly ill advised from a humanistic standpoint. Diversity IS richness and that kind of riches far supersedes any monetary standards of wealth. If Jews wish to hold a parade, I support that and would be happy to attend, either with or without any of my numerous Jewish friends. If Muslims did, I’d similarly think that was great and would only add to the diversity of our beautiful town. Leave it alone, Geri…this is no way to combat racism. It only perpetuates the current intolerance which serves only to separate us as people. Embrace it and you will take a step towards unity, not disunity. I get the sense your heart is in the right place, I just wonder if you’ve considered this perspective. You are clearly missing the point, Edward. The reasoning behind changing the “Christmas Parade” to a “Holiday Parade” was not to disparage Christians or the Christian faith, but rather to make EVERYONE of any and all faiths (or no faith) feel welcome to participate. Would you rather have one big parade/celebration where everyone feels welcome and is happy to participate, or eight smaller parades/celebrations where certain groups are implicitly excluded? The point is to get more people involved, to make it truly a community event, rather than just a Christians-only-others-need-not-apply type of event. Re-read the part in Judi’s piece above about the chorus and the decision to change it to a “Holiday Show.” That pretty much spells it all out for us. 1995 may have been a long time ago, but the actions then are still repeated now. La Jolla is a community, just like Pacific Beach, Ocean Beach, Poway, etc. These communities are based on many different ethnic groups. One sure way to stop neighborhood fighting is to act as a community; not as an exclusive area for some specific group. Do you remember when the first Muslim family moved into La Jolla? It was plastered across the paper. One would have thought that WWIII had begun. Why? Because they are different than others? Because they may dress differently? Because their beliefs are different than ours? What I am suggesting is that La Jolla work as a community; it’s a wonderful place to live, to raise children, to enjoy mother nature. How great it would be if tolerance was the norm, not the snobbery shown by some today. La Jolla could have a parade second to none; the encouragement of all ethnic groups to participate would erase the stigma mentioned in the Wikipedia article. And the monies generated would do far more for the coffers than what is currently the parade in December. One large parade – for everyone. Actually, Andy, I don’t clearly get the point and the De-Christmassing of Christmas on the Prado was a foolish, divisive move. WHY do non-christian people find Christmas threatening or offensive? It is a time of goodwill. I recently went to a Polish Festival. I didn’t feel excluded because of my NON-Polish status. It’s just silly, Andy and I DO get it. It is an attempt to cater to the “easily-offended club” which has become vociferous. A perfect example is Atheists. Why should a belief in nothing be inflicted on those with beliefs? If someone from a different culture comes here and objects to our customs, it is just as foolish as me going to another country, attending a cultural festival and complaining about it. How does THAT make ANY sense? We are a culture losing our culture and catering to the belief that it is better to be bland and homogenous than stand for our legacies. Again, Andy, our diversity is our strength. No Edward, you clearly, willfully DON’T get it. This is not an anti-Christian/Christmas thing. This is an inclusion thing. But you obviously refuse to see that. Your position equates to nothing more than promoting Christianity over all else as the only accepted national religion. Our position is one of treating those of other faiths equally, as a welcomed part of the community. That’s fine, though. You’re entitled to your opinion. But just know that everyone outside of Kansas and La Jolla (and Fox News) disagrees with you. Completely. Actually, no, I don’t promote Christianity any more than I promote Judaism, Islam or anything else people wish to embrace as their spiritual path. I don’t even “promote” my own spiritual beliefs, which are nobody’s business, really, than my own. What I do say is to try to DE-Christmas the Christmas the Christmas Parade is every bit as wrong as any anti-semitic experience YOU’VE ever had. What you don’t see is that you are discouraging inclusion, not promoting it. Live and let live means JUST THAT! regardless of your own personal axe to grind. Leave others alone…regardless. If you decide you wish to hold a Jewish Parade, or a Muslim parade, let me know and I’ll come enjoy it too and probably learn something about how those cultures live, celebrate and enjoy life. Edward, the problem with honoring all groups – separately – is that the groups will be more self-centric. When people of any persuasion honor only themselves, the natural and inevitable consequence is that they’ll look askance at others. Sharing our cultures doesn’t dilute them, it informs them. A culture that stands against sharing in other cultures is cultish. While your point of view might sound good in theory, it’s disconnected from the realities of the unhealthy consequences of separation rather than integration. Actually…realities are dismal, Zach…we need to further more IDEALS. Giving in to the kind of realities we now see as prevalent simply worsens the slide towards absolute separatism and negativity. Yes, Edward, I stand for something: inclusion. We won’t be able to live cooperatively unless we SHARE in each other’s lives, rather than separate into disparate factions. The fact that you see realities as dismal reveals something about your nature. You sound reactionary rather than visionary. The ideals of which you speak, I imagine, are “traditional,” i.e. patriarchal, aristocratic, hegemonic. Please tell me, how does inclusion “worsen the slide towards absolute separatism and negativity”? You’ve got me puzzled with that one. Rather than further more ideals, we need to further more real social evolution. Everyone knows separation breeds racism, classism, and all those other -isms. You’re going in the wrong direction, Edward, apparently because you lack vision, hope, and the ethos of “one for all.” Being fearful, you retreat to your ideal of security among people of like kind. That’s a fatuous ideal. Security lays in sharing each other’s lives, knitting a human family. Please get onboard. Zach…either you’re reading these posts in a rush…or you are so set in your position that you’re not hearing what I’m saying. HOW can acceptance, tolerance and celebration of each other’s cultures without squelching them be anything but a good thing. As far as realities…read the papers, watch CNN…people are more dissatisfied and disillusioned with government and their roles within society than they have been in a long time. Patriotism, which once bound us has been discouraged now that some cultures find that somehow threatens theirs. CO-operation, not homogenization allows us to maintain and sustain rich heritages without pretending they don’t exist. Why CAN’T you learn, enjoy and celebrate a culture not your own. Why does there have to be a bland nothingness which has little but fear of offending in common? Embrace other cultures….don’t try to create one based on nothing. Someone’s brain has been washed by Sean Hannity and Bill O’Reilly. Another Fox News propaganda victim. Well, I live out here in the Jewel, folks, and can say from personal experience on the Bersin Board of Education, that the Christian/Jewish card in the modern era is played both ways, depending on the circumstances and the advantage sought by one side or the other. For a matter even more significant than the old name of the “La Jolla Christmas Parade,” there’s been a years-long struggle by Hillel to get a building approved for the lot it owns up on the edge of a Jolla Shores residential neighborhood across from UCSD. It’s the La Jolla land-use equivalent to wandering 40 years in the desert. Andy Cohen is absolutely right; you have missed the point. Religion never had anything to do with the names changes of the events listed below. If the La Jolla Christmas Parade committee insists on being different, they should call this annual December event the “La Jolla COMMUNITY Parade.” If the name was changed from the “La Jolla Christmas Parade” to the “La Jolla COMMUNITY Parade,” monetary donations would QUADRUPLE. . .and so would attendance. La Jolla is still living in the late 19th century (1887) and first half of the 20th century. And…I find each and every one of those decisions ill-advised, silly and fraught with the kind of thinking that brings us to a sad state affairs. Rather than investigate other beliefs and cultures, we try to eliminate any differences. Why is it that the biggest mouths are often accompanied by the smallest minds? Oh…and to hell with monetary donations going up by cultural homogenization. Thinking that way is one of our society’s biggest downfalls. Here’s your mistake, Edward: having inclusive community events doesn’t “eliminate any differences.” While I’m not a fan of political correctness, it’s important to understand that the purpose of those attitudes is to protect people from rights violations (or is that ok with you? ), not to make us all think or act the same. Humans, being imperfect, will hurt each other if we don’t have protections against that. Unfortunate as it is, we need “political correctness.” There is ONE way in which we do all need to think and act the same, and that’s to act cooperatively, as in working and living together as a whole community. Absolutely…and I don’t see that eliminating a Christmas Parade at Christmas would preclude this. If we were to have a La Jolla Spring Parade or a Summertime in La Jolla Festival…and we do have a number of non-holiday events in this town…that would certainly fulfill that. Zach, or Andy…I encourage you to start organizing that…I’ll support to the best of my time & ability. There’s no rational response to people who can comfortably make outlandish statements like that. Let’s hope his expertise was limited to aerospace, not sociology or philosophy. I have never read comments from such a negative individual. Everyone else speaks of diversity and inclusiveness. . .Edward plays the religious card. Edward will always have the last word. Holy crap, “Pfaff,” I’m not religious, but that doesn’t mean that I believe in stomping on others’ beliefs and celebrations. By taking Christmas from those who enjoy and celebrate Christmas, you do just that. Are you unable to attend a celebration that isn’t strictly in “your” pigeonhole? Thank you for your fine article. I grew up in La Mesa and lived in La Jolla when I was in college and do so again now as a professor. The subdivision we live in, around Sugarman, was built so that the Jewish professors at UCSD could have a place to live. For example, Jacobs and Viterbi, founders of Qualcomm. San Diego’s non-tourist, non-war economy is based mainly on non-Christians like them. There is a dying clique of the rich who want only to circulate within their own circles in La Jolla. They cling to their symbols, like the cross on top of Mt. Soledad. I see it every day, and given the history of La Jolla, I take it as a statement “Non-Christians Stay Out!” But La Jolla is changing. Our children go to La Jolla High and most of the top students are not Christians- they are Bhuddists, Muslims, Hindus, Jews, and the majority are atheists or agnostics. It is a shame that the old power structure cannot find the grace to be more welcoming and inclusive. Thanks, Eric. I was not aware that a section of La Jolla was set aside for Jewish Professors to live in, but thinking about it it stands to reason. When the University started, not so long ago, where else would you live? Couldn’t have you living in all of the neighborhoods. Looking at history Jews in neighborhoods do not adversely affect property values; and, in fact, seem to raise the value. Thanks for your comment. The percentage of Jews in La Jolla in 1960 was less than 1% with zero synagogues. In 2013, according to the San Diego Jewish Journal, 32% of La Jollans are of the Jewish faith and there are three (3) synagogues. I would enjoy meeting you at your convenience to discuss this matter. Without providing your email address or telephone number on this forum, perhaps we could meet somewhere in La Jolla later this week.